Every since our fourth son was little, he interacted with the world differently. He was reserved and reflective. He would rather play alone, observing everyone around him. Our fella was quite different from me. That’s when I realized, unlike his three older brothers, our youngest son was an introvert. Now, this is not earthshattering, but it did mean I needed to adjust how I was going to help our child thrive at home and in school. My expectations needed to shift. After being an educator for over 10 years (at the time we had him) and being married to an introvert, I knew I had to take a different approach in raising this little guy. As his momma, my responsibility is to be his advocate. To help him, I had to spend some time genuinely understanding how to best support him. Let me say, this was not always an easy task with my strong extrovert personality. Before we start diving into ways to help our introverts thrive, there are a few foundational truths I want to establish. God uniquely created your child with his/her temperament, just as He created you with yours. Being an extroverted parent with an introverted child creates opportunities for you to appreciate the intentional plan of God. Children who are introverted are not this way because they are depressed or anxious. They interact with the world in a different way than extroverts. Everyone will display some extrovert and introvert qualities. Unfortunately, some people have associated an introverted personality as a weakness. These words lead children to feel ashamed or inadequate, causing them to hide their true selves. This is especially true when parents begin pushing their children to become someone other than who they are. That’s why I knew; I was responsible for adapting not my son. If you have an introverted kid and you are an extroverted parent, here are three ways you can help your child thrive. People who have an introverted personality NEED downtime. Parents, please understand this is not optional. Introverts need time to process, reflect, decompress, and recover from the day, especially if the day required plenty of social interaction like school. While you may enjoy having a full social calendar of playdates, soccer practice, and small groups as an extrovert, all of this can be overstimulation for your introverted child. Now, I am not saying you should not have your child involved. Just understand HOW it impacts your child so you can adjust your expectations. Don’t take it personally when your child wants to retreat into his bedroom to play alone. The alone time allows your child to recharge. If you are anything like me, I was concerned the alone time meant our son was having a hard time at school or struggling with adjusting. So I would push him to socialize. Ugh! Now I realize, his need for time alone was not a sign he was emotionally distressed. It meant the opposite. After having downtime, most introverts don’t mind being social and interacting with others. They are not energized by it like extroverts. How do I help with this? Put downtime in your daily schedule. Every day our son is allowed 20 minutes of downtime when he comes home from school after his snack if he wants it. He might go in his room to lay down on his bed or play with his toys. Either way, it makes a difference when he has to complete homework, and we chat about his day. Encourage teachers to allow your child quiet time. At the beginning of each school year, I talk with my son’s teachers to let them know about his personality traits and ask if there was a time in the day for him to work independently. Continuously working in small groups throughout the day was a lot when he first started school. Just telling teachers this one little detail made a big difference as he continued to move through elementary. Another strength of introverts is their ability to focus intensely on one thing. Moving from one thing to the next can increase frustration and even anxiety in our children who have introverted personalities. Instead of trying to shift your child’s focus, consider cultivating their passion. Give them opportunities to learn and pursue their interests. Our youngest has been fascinated with cars ever since he was 1 ½. I tried to get him interested in other things, but everything led back to cars. Now at nine, he has learned about engines, speed, how cars are shaped, and all sorts of things that amaze me. Instead of trying to force him to be interested in something else, I just started expanding his knowledge. If they have an interest, include that interest in the books, movies, projects, and papers. Show them all the ways they can expand what they know. Who knows, they could end up being someone to design or create something new in that field. Many children who are introverts tend to respond better to one-on-one interaction than in groups. After having time to reflect and decompress from the day, don’t be surprised if your introvert wants to chat or even become a chatterbox. They want to talk and share, but after having time to alone. This is especially true when you need to discipline your child. One of the mistakes extroverted parents can make with introverted children is to discipline them in front of others. Instead of correcting the behavior, the child will often internalize creating other problems. As much as possible, learn to praise your child loudly and correctly them softly. Take your child into another room. If you are out in public, speak softly to include only you and your child in the conversation. Our goal is to correct the behavior not embarrass our child. If you have multiple children encourage taking turns. Each child receives one-on-one time with the parent. When this is not available, stress the importance of each person listening without interrupting. Create outings special to your kid. From going to the library or even going on a walk together, you have time carved out just for that person. Find activities that are stimulating for both of you. From playing sports to making crafts, there is something both you and your child can enjoy together. More importantly, shower your kid with love. Remind him, he is loved, unique and intentionally created by God. The world will do enough to remind him of his flaws. Use your time with him to cultivate, nurture and build the mighty man of God he is growing up to become. Momma, your extrovert qualities are a strength too. 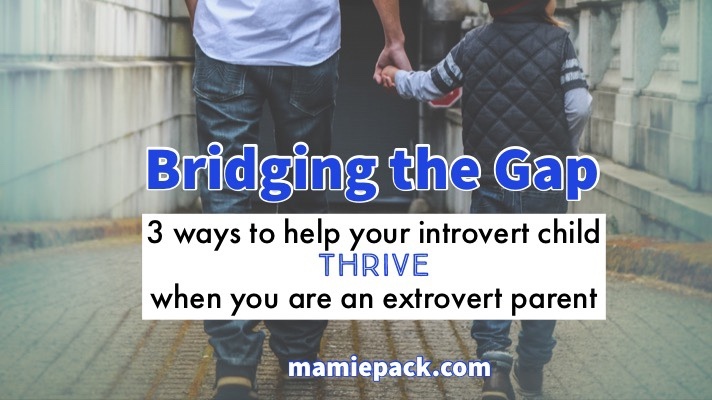 Let your love bridge the gap between your extrovert personality and your kid’s introvert personality. You win together! As an introvert myself, I totally agree with this. My introvert son, however, needs his alone time. He doesn’t necessarlily want one-on-one time. He just wants time to be by himself. And I totally get that. Wonderful Article. Great tips. I love how you included cultivating their passions. It is very clear how much you LOVE your son and fills my heart with joy. You go mom! Even with teenagers I still designate one on one time with my kids. And they are so lovely on their own! Thank you for this! No one really talks much about this and it can be a challenge for both the child and the parent and it works the other way as well. I absolutely love this. Enjoyed it. My eldest is an introvert. This article is so helpful! I am a total extrovert and my son is a an introvert. It is challenging for me to try and find ways to not push my assertiveness on him to get him to be more social. I think we are probably the opposite in my household. I’m more of an introvert, or at least on the quiet side – and my kids are very social and outgoing. It is good to try to find a balance. Oh, you must need the quiet time to decompress. 😉. At least you know this about yourself to know how to interact and help your kiddos. Great post, Thanks for sharing the tips with us. Pinned the post (as simpleblissfullife) and followed you. This is one of the best articles I’ve read this week! I have yet to discover if my son is an introvert or extrovert. He doesn’t get to hangout with a lot of kids so it’s hard for me to tell. When the time comes, I would love to know how to address it. Your entry is definitely going to help me a lot in the near future. Sometimes it can be a little challenging to determine if our children are introverts or extroverts because we all have elements of both traits. But there are small ways of identifying their preference toward one or the other. These are amazing tips. Thank you so much. I have two boys who are very different personalities and I love how you simplify the introvert. It amazes me how unique each child can be within the same home. I am humbled by the opportunity to raise them. I have the opposite problem. My children are extroverts and I’m practically a hermit! I’m getting better by forcing myself out of my comfort zone, but I do not like social interaction! That is so interesting! Do you think my tips about helping introverts was helpful? I’ll never thought of my son as an introvert but after reading this he definitely is. It makes such a difference in knowing how to advocate for them and help them adjust.